With corporations like Google, Facebook, Dell and Reddit beginning out of college dorm rooms, many college students have the ambition and resources to leave a lasting impact on their university. Nonprofit organizations are no exception. According to the Center for Nonprofit Management, there are currently more than 1.5 million nonprofits registered with the Internal Revenue Service. GHC works with a medical supply warehouse in southern Illinois to donate hundreds of different types of supplies ranging from mouthwash to hiking sticks to scalpels. More than $10 million worth of supplies will be collected and shipped to refugee camps through the organization. The supplies go to five United Nations Refugee and Works Agency refugee camps located in Syria, Lebanon, Jordan, Gaza and the West Bank. The United Nations Relief and Works Agency created an Excel sheet with the supplies it needs and its destinations. Saleh said she has already secured the network with the medical supply distributor. They are gathering supplies this week and she hopes to have them shipped by the end of the year. Saleh said it all began when she visited the West Bank in summer 2010 as a volunteer for the Palestine Red Crescent Society, which is the central hospital and education center in the West Bank. Saleh said that the hospital lacked basic medical supplies when she volunteered there. After the trip, Saleh said her work started as a charity project to donate supplies to the Palestine Red Crescent Society, but she first needed to raise money to cover the shipping costs, which can be more than $10,000 overseas. Because GHC was a new nonprofit and it took more than a year to reach nonprofit status with the IRS, “there was nothing substantial we could use to apply for grants or to receive donations,” she said. Saleh contacted more than 500 people to ask for help and donations, held fundraisers and reached out to organizations like churches, fraternities and sororities. She took out a loan for the dues that still remained, which were paid back when GHC received the Drucker Grant, a $100,000 award for nonprofit innovation, over the summer. Saleh contributes the nonprofit’s success to hard work and lack of sleep. Gregory Damhorst, graduate student in Bioengineering, founded Illini Fighting Hunger in 2012. IFH is not a standalone nonprofit and instead runs through the Wesley Foundation, a campus ministry run through the United Methodist Church. The organization packages food from bulk into smaller packages that are more suitable for distribution in a food bank or pantry. IFH works with groups in the community, such as religious organizations and Registered Student Organizations, which then sponsor the cost of the packaged food and resources needed to host a packaging event, said Max Colon, president of IFH and junior in LAS. “We help connect these partners with the most cost-effective sources for meal packaging ingredients or single ingredients like rice or beans. We provide the leadership needed for successful event facilitation, and we provide the necessary packing equipment including heat sealers, scales, weigh baskets, bins, scoops, funnels,” Colon said. When Damhorst was an undergraduate student, he was involved in a few meal packaging projects that introduced him to the process, but he then realized there were multiple factors increasing the overall cost. Other nonprofits around the country can package a meal for 23 to 25 cents per serving, he said. The organization’s goal was to raise $13,000 to package 50,000 meals. It received equipment on a truck from Iowa and the executive director of Meal of Hope from Florida flew out to Champaign to be present for the two-hour packaging event. As a team of five graduate students, they purchased their own equipment to reduce the long-term cost and began packaging food at half the cost of other organizations. Today, IFH has worked with 6,820 volunteers to package more than 216,569 pounds of food. They package a “casserole” that contains four ingredients and also package single ingredients including rice, pinto beans and macaroni pasta. 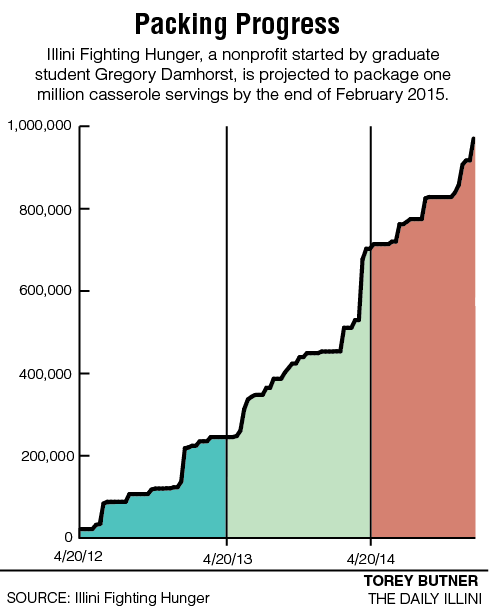 The organization is on track to packaging one million casserole servings by the end of February 2015. IFH has spread to other universities and off-campus locations including Benedictine University, Bloomington-Normal, Chicago, Dekalb, Rockford, Springfield and St. Joseph. The annual Community and Campus Day of Service is IFH’s largest packaging event and will take place on April 11, 2015. Its goal is to package 148,000 meals, according to Colon. Brittney can be reached at [email protected].